POLICE SAY A suspect had his first name stenciled on a shirt he wore while breaking into a taxi company in Pennsylvania where he used to work. That’s why 26-year-old Joshua Jording faces a preliminary hearing on burglary, theft and related charges tomorrow. State police security video showed the suspect wearing a shirt with the name Josh on it. They searched Jording’s home and found that shirt, as well as two guns and two smartphones taken during the burglary on 2 December at the Veterans Cab Company in Unity Township. Police also found marijuana and drug paraphernalia during the search. Jording was released on bail. The Associated Press was unable to contact him. 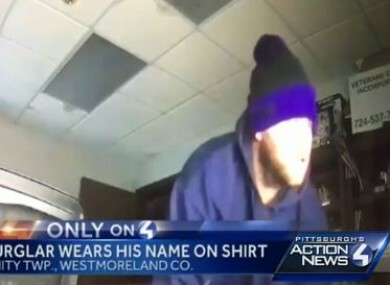 Email “Burglar caught after robbing office while wearing shirt with his name written on it ”. Feedback on “Burglar caught after robbing office while wearing shirt with his name written on it ”.